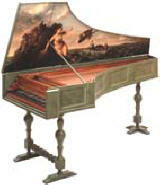 Anonymous Neapolitan harpsichord sold to the Markiezenhof Museum, Bergen op Zoom, The Netherlands. In April of 1991 I was fortunate enough to be able to buy an historical Italian harpsichord from a private owner in Brussels. A photograph of this instrument with some details of its original case and lid painting can be seen by clicking on the image below. the case of the instrument is sufficiently robust to be restored back to playing condition without danger of twisting or distortion. the instrument has been restored and re-restored many times in the past. none of the original ephemera has survived these many restorations, and would therefore not be destroyed in another modern restoration. the wrestplank has been riddled with woodworm and has a structure that resembles a sponge rather than a solid piece of walnut. It is now insufficiently strong to withstand string tension. The nut is not original, but the positions of the original and eighteenth-century nuts are clearly visible on the top surface of the old wrestplank and these positions can be transferred to the new wrestplank. A new nut would have to be made using the bridge as a model. the advantages of restoration greatly outweigh the small amount of information that would be lost in a restoration to playing condition. The discovery that this instrument was made in Naples, and the need to study other instruments also made in Naples as part of the background work necessary prior to the restoration of the instrument has further stimulated my interest in Neapolitan harpsichords. This instrument has been sold to the Markiezenhof Museum, Bergen op Zoom, The Netherlands as a restored and playing harpsichord. The instrument is now in the period room on the first floor of the Markiezenhof Museum.